Theater Latte Da "we do theater musically" is closing out their brilliant 2016-2017 season (which also included an exquisite Ragtime, the return of favorites A Christmas Carole Petersen and All is Calm, and a delightfully playful Peter and the Starcatcher) with Six Degrees of Separation. If you're thinking - wait, that's not a musical - you're right. But Latte Da has added music sparingly and organically to make the storytelling better and clearer. There's so much depth in this piece that I haven't yet been able to unpack it all. It reminds me of Mad Men - the highest form of the art we call television. Watching Mad Men, I always felt like everything meant something - every prop, every costume detail, every camera angle, every word, every pause. I may not have known what it meant, but I could tell that every detail was intentional. That's how I feel about Theater Latte Da and director Peter Rothstein in general, and this production in particular. Every detail of design, direction, acting, means something. I might not know what it all means, at least not upon first viewing, but I appreciate the amount of thoughtfulness that goes into every choice. I knew next to nothing about the play going into it, even though I did see the 2003 production at the Guthrie (being pre-blog, the only thing I remember about it is that shortly after I saw it, the box office called and asked if I wanted to become a subscriber, 5 shows for $100, and I said sure; now I'm about to renew my subscription for the 15th year). And I think that's a good way to go into it, so I won't spoil too much of the plot here. The basic premise is that a wealthy couple (played by Sally Wingert and Mark Benninghofen, because who else would you possibly cast that could be this good in these roles?!) 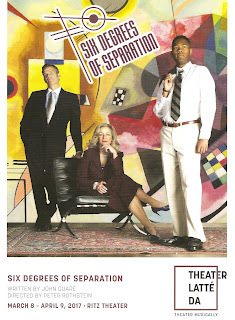 on NYC's Upper East Side is conned by a young black man (JucCoby Johnson, one of my favorite new actors on the Twin Cities theater scene) who pretends to know their children and be the son of Sidney Poitier. What then unfolds is a treatise on race, class, and celebrity in America. What struck me most about this young man is that he isn't doing this for the money, he's doing it because he longs to be part of that seemingly perfect posh world he only observes from the outside. 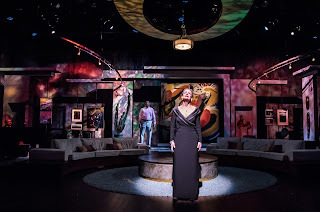 The play is very smartly and innovatively written, with characters breaking out of scenes to narrate directly to the audience, which is made clear by lighting changes (designed by Barry Browning). Director Peter Rothstein builds on this unique style by having the entire cast on stage for most of the show, stepping into and out of the action when needed, or supplying props. Everyone in this yummy 12-person cast plays their role(s) well, whether they're in one scene or many. And because this is Latte Da, there is music. Four members of the cast also plays instruments and provides a sort of smooth jazzy soundtrack to the story. Jay Albright plays piano and provided the musical arrangements, with Riley McNutt on saxaphone, Dan Piering (who appeared in a Latte Da show as a teenager - you know you've been doing this a long time when you watch child actors grow up onstage) on cello and guitar, and Kendall Anne Thompson on guitar. 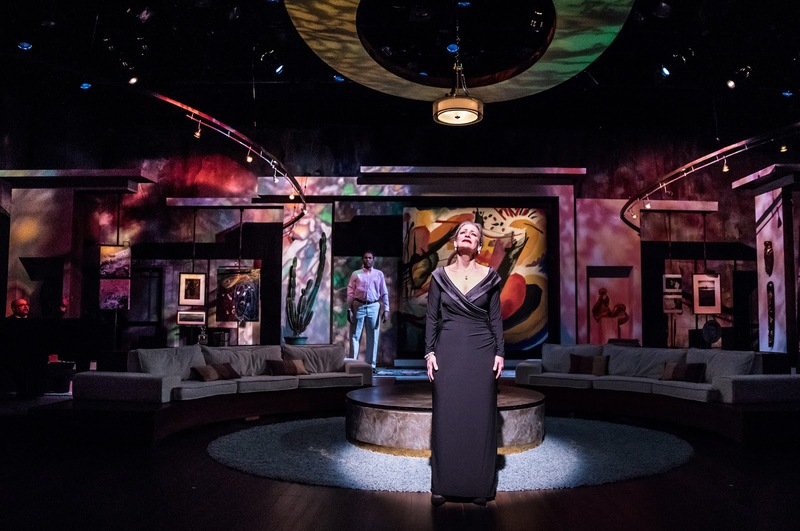 A word or two must be said about the truly incredible set, designed by Kate Sutton-Johnson, who also associate directs. Latte Da's sets at the Ritz lately have been charmingly rustic or shabbily chic, matching the gorgeous bones of this old theater. Not so here. The Ritz has been transformed into a chic, clean, modern, art-filled NYC apartment. The circular shapes of the huge Kandinksy hanging in the center are repeated in the furniture, props, and structure of the room. Most of the art displayed is by Twin Cities artists, which is a cool way to combine the visual and theatrical arts. 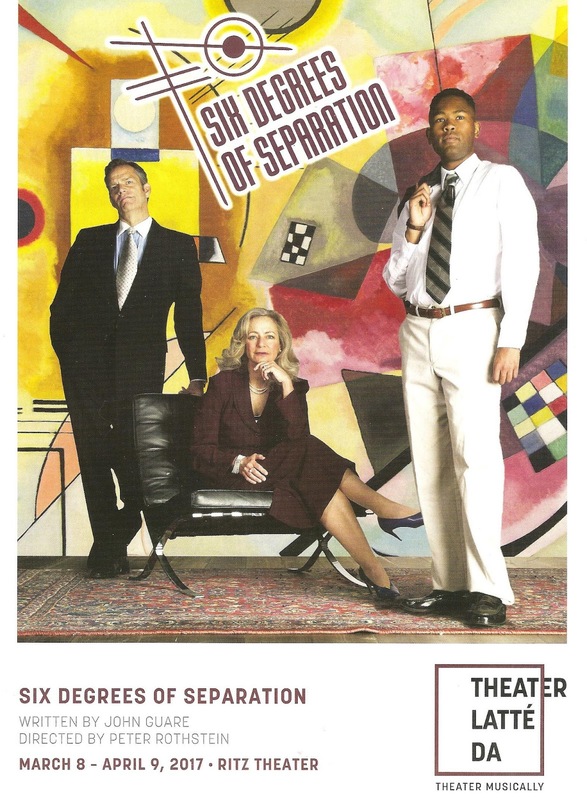 Theater Latte Da's Six Degrees of Separation is a gorgeous, thoughtful, innovative, musical interpretation of a smart, funny, thought-provoking play. It's playing through April 2 at the Ritz Theater in Northeast Minneapolis, don't miss it.